Inside zipper boot. Cozy warm textile linings. Ribbed rubber sole for traction. 1 1/2 inch heel. Made in Finland. Old world tradition with new world technology. 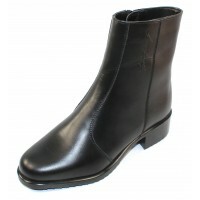 Palmroth represents stylish and comfortable shoes & boots. It's Scandinavian design is simple, clean and elegant. The Palmroth design is unique, all products have been created by the Palmroth design department, combining comfort and elegance with specially chosen materials. Palmroth uses high quality materials which are best for all weather conditions. Special all-weather material and waterproof-suede are designed for the demanding, cold and slushy weather conditions to keep your feet dry and warm.All-weather material is also light weight and easy to take care. Waterproof-suede is dirt and water resistant Italian leather, doesn't remain salt marks, looking good all the time. Palmroth boots have special light and comfort sole for northern conditions with superior grip.